Sacramento Leak Detection and Repair Service | Bullseye Leak Detection Inc.
Gone are the days when a leaky faucet was just an annoyance. Now it's money down the drain. Over the past decade our family-owned specialized plumbing business has steadily grown to provide a range of services that saves time, saves water, and saves money with fast and expert solutions. We've made a name for ourselves! Check us out on Yelp, Google, Angie's List, and BBB. A core team of expert technicians and dedicated administrative staff consistently delivers expert services. Timely, thorough, cost-effective and clear, understandable written reports. Time is money. Today, water is money, too. A serious pipe break can inflict serious financial damage. Professional leak detection saves time otherwise spent blindly stumbling around for answers and saves money with fast, expert water-saving solutions that lead to a fast leak repair. Pool or spa losing water? Slab leak? Water damage on the ceiling? Sewer line backups? Unmarked underground utilities? Water intrusion? Need a pipe repaired, rerouted, or replaced? From thermal imaging and moisture meter inspections to water and fire main leak detections, GPR utility locations and correlator logger testing, we take a systematic approach to every job. Our technicians analyze the entire plumbing system to pinpoint exact locations and breaks, and we deliver accurate, sound solutions to keep your repair costs at a minimum. Water is precious. So are your time and money. Over the past decade, Bullseye Leak Detection Inc. in Sacramento, CA, has steadily grown to provide a range of specialized plumbing services, from leak detection, line location, and sewer inspections to an array of plumbing repairs. As a family-owned and -operated company, we pride ourselves on honest, high-quality service. We maintain these high standards by providing our team with consistent, ongoing training. Our experienced detection specialists employ the latest noninvasive, nondestructive detection techniques in concert with state-of-the-art equipment. Our repair crews carefully contain work areas for dust and debris prior to excavation, and identify the most efficient, least destructive repair methods for the job at hand. We hold a C36 Plumbing license (935197) and carry both general liability and auto insurance in excess of $1 million. 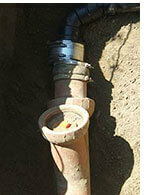 Contact us for the best leak detection service in Northern California. Unchecked pool and spa leaks can cause costly damage to pumps and equipment, raise your water bill, and force you to add more and more chemicals or salt just to balance the system. Guesswork wastes valuable time, water, and money. Our leak detection experts locate underground pipe breaks and structural cracks by methodically testing the entire system. And our repair crew resolves leaks efficiently and effectively. Cracked skimmers, broken suction and return lines, leaky lights—We find and fix every leak under the sun (including the one under your deck). 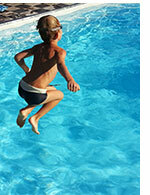 Our swimming pool and spa leak detection team is ready to serve you and save you money. A high water bill, a hot spot on the floor, a mysterious sound, an odor, or puddling water may be the only clue that you’ve got a leak. Maybe your hot water heater won’t shut off, or water is flowing out the side of your foundation. Like all good detectives, our expert technicians pull together all the clues and investigate thoroughly, using noninvasive, nondestructive equipment, to pinpoint the problem with our water leak detection equipment and skills, and effectively resolve it. Whether we're working on a service line from meter to house, a commercial fire main, a hot or cold slab leak, a high-pressure irrigation main, gas leak detection, or a mysterious water intrusion, accuracy is our top priority. Finding the leak is only half the story. An effective repair, professionally executed and competitively priced, provides the satisfactory ending. Our repair crew arrives at every job with a detailed leak detection report, an arsenal of high-quality tools, and years of plumbing experience. Whether repairing a sub-slab leak or re-piping an entire house, we believe in cost-effective solutions that respond to the particulars of your home and your needs. We’ve also partnered with Ygrene Works to provide financing. Sewer back-ups? A slowly draining line? Our video inspections pinpoint sewer-line problems, including offsets, breaks, and roots, identifying their exact locations and depth. Video of the pipe's interior as well as a footage counter and locating sond document problem spots and laterals. When excavating a sewer line or breaking ground for another project, you need a lay of the land. We locate all private utilities, including cable, telephone, fiber-optic, electrical, gas, water, and sewer lines, as well as storm drains and septic tanks, to avoid costly collateral damage. U.S.A. will only mark public utilities to the meter. We do the rest, marking the remaining private utilities on the property. It's just one more way we save our customers time and money. Regardless of whether we’re performing a spot repair or an entire sewer system replacement, we approach every job with the same attention to detail. Plumbing repairs can impact your life. 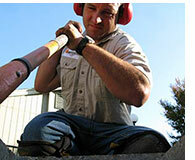 A house full of dust and debris or a yard full of upended landscaping can wreak havoc. Property protection is the very first step on every job we perform. For exterior repairs, we lay tarps and carefully remove ground cover. For interior repairs, we erect zip-wall containment and lay down construction paper and plastic along the construction path. To further minimize the disruption and cost associated with excavation, we offer trenchless sewer replacement. Instead of 100 feet of excavated pipe - and consequent landscaping/hardscaping removal - this process requires only two access holes on either end of the affected pipe. 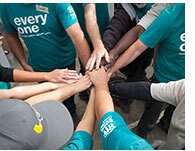 We value the opportunity to work on your property and take that responsibility seriously. Every commercial project has a particular set of budgetary and scheduling requirements. Our team of administrative and field specialists will determine the best course of action for your particular project based on those requirements and your scope of work. BULLSEYE detection and repair technicians have extensive commercial and industrial project experience, and we provide our team with the specialty equipment and tools for inspecting and repairing everything from Olympic-size swimming pools to water treatment plants to medical facilities and business parks. Commercial projects can be complicated. With BULLSEYE’s expertise and professionalism, you’ll get the timely, cost-effective solutions you need.